The most important measurements that will determine success in a fitness and nutrition program are CONSISTENCY and PERSISTENCE. Consistency: Are you doing it on most days without big lapses in your routine? Persistence: Are you doing it for a long time…even when things are plateauing and aren’t going as planned? If you are a starter and stopper…like many of us are…these are the two things you need to attack FIRST. When goal setting, it is best to start with the end in mind and work our way backwards. If we know our goals ultimately end with consistency and persistence, we need to address these first. How can you be more consistent? How can you be more persistent? When things do not go well, people who are persistent will maintain consistency. Those who are not persistent will fall out of their routine and fail to maintain consistency. As we learned in part 1…consistency is king. Your workouts used to crush you. You would get winded quickly and couldn’t do one pushup. Over the last 6 weeks, you have worked your tail off. You have been consistently exercising 4 days per week and you feel like a million bucks. You have lost some weight, your energy has improved, and you can do 5 full pushups from the ground. This is the best you have felt in years and you are proud of yourself. Then, one day, the stomach bug hits. You’re laid out in bed for three days. You miss an entire week in the gym because you just can’t muster up the energy to get there, even after the bug has passed. You go back to the gym and it feels like your first day all over again. You cannot believe that 6 weeks of hard work is GONE, just like that. You go back the next day, and it’s not much better. Part of the reason you were able to stay consistent is because you were seeing significant progress. The progress was what was addicting to you. Now, here you are…You took 2 steps back without a step forward in sight. You get discouraged. You don’t quit, but you start to back off a little. 4 days turns into 2-3. It’s easier to reason with yourself that you “can’t get there” when your kids’ schedules are crazy or you’ve had a late night. Because your consistency drops off, progress stalls even more. You become more discouraged. After a few months, 2-3 days turns into 1-2. A few months after that, you’re completely out. You are persistent through the bad times. You understand that progress does not happen in a nice, linear fashion. You feel terrible today, but you remember that CONSISTENCY is more important than INTENSITY. You know if you continue to show up, you will stay in your routine. If you stay in your routine, you will eventually regroup and get going back in the right direction. Life is 100% guaranteed to get in the way. You will not be at your best all the time. You will have rough days. You will have rough weeks. You may even have rough months. Your progress will stall. You will plateau. You will feel like you’re getting worse. Your body will adapt to whatever it is you are doing. Persistence comes the fundamental understanding that this is normal. Not only is it normal, but it is necessary. You’re body needs time to adapt to change. 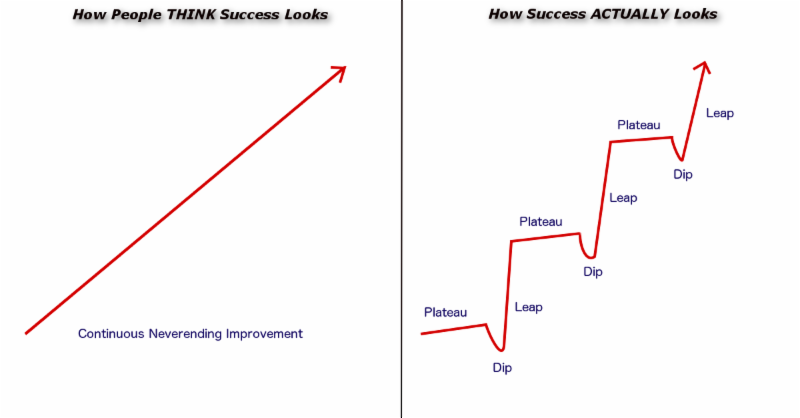 Plateaus and dips are part of the process of getting better. In order to see results, you will need to maintain consistency through the good times as well as the not-so-good times. – Make a small change in sleep, exercise, or nutrition. – Change your environment – Getting outside or working out with a buddy can give you a spark. – Set a new, different goal – Signing up for a something like a 5k, mud run, or Powerlifting meet can bring intent to your training. Success is not linear. Try to look at fitness as a long-term process that relies on consistency instead of a short-term burst that relies on intensity. By approaching a program with this mindset, you will know how to deal with things when life gets in the way. In parts 1 and 2, we have discussed consistency and persistence and how they apply to exercise. In part 3, we will shift the focus to nutrition. What is best for you may not be best for YOU. 2-3 days per week of lifting weights at a moderate intensity for 35-45 minutes. 2-3 days per week of low-moderate intensity aerobic exercise for 30-60 minutes. Increased NEAT (Non-exercise movement. Aiming for 10,000 steps a day is a good example). This is an “ideal world” scenario. This type of program works. It is simple, effective, and sustainable for a long period of time. But is it for you? 1. Do you enjoy this type of exercise? If YES, keep reading. If no, skip to Number 2. If your answer is yes, great! Start with basic movements like squats, pushups, deadlifts, and rows. Track progress. Each week, look to either increase number of reps, number of sets, or make small increases in weights. Do little things to hold you accountable to showing up. Little things like putting your workout clothes and sneakers by the door the night before can make a big difference. 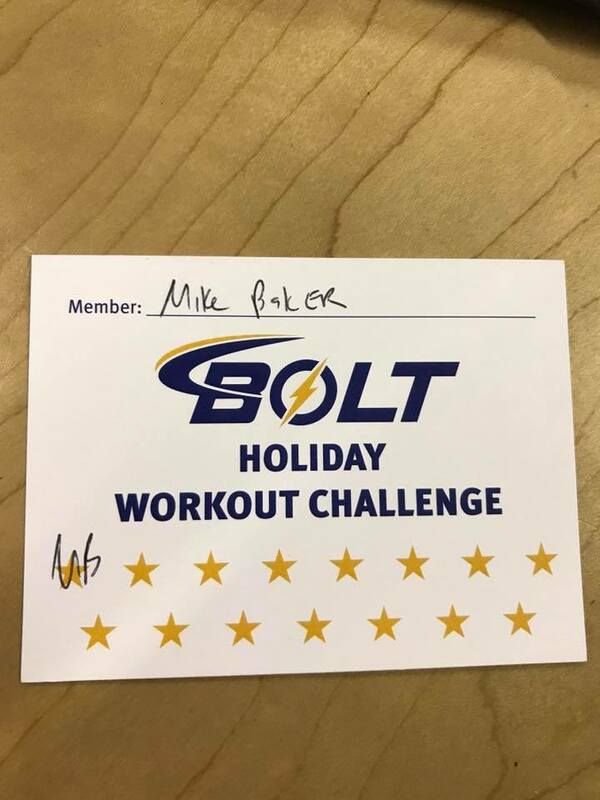 We made up little workout cards last month to hold our members accountable to a certain number of workouts in the month and marked them off every time a workout was completed. You would be shocked at the difference this card made for people to hold themselves accountable! If you enjoy this type of training, getting started will be the hardest part. The good news: You WILL make progress. Since you enjoy it, you shouldn’t take too long to turn your routine into a habit and maintain consistency. 2. Do enjoy this type of exercise? If the answer is NO, then we need to make a change. As an arrogant young coach, I had this belief in my head that I knew the right way, and this was the only way. Just because something looks good on paper does not mean it is right for YOU. At least not right now. New Years comes along and you set a New Years Resolution. You join a gym. You hit the elliptical for 30 minutes and rotate through a few machines. This is either what you have been told to do, or all you know how to do. It’s boring, monotonous, and you dread every minute of it. But you are motivated and inspired…for now. You have made a commitment…a resolution… and want to stick with it, no matter how brutal it is. But that motivation and inspiration will, without a doubt, wear off. Without motivation and inspiration…why would you do something that you absolutely despise every single day? You won’t. That’s why gyms all over the country, today on January 9th, are slammed with new clients that will not be there on March 1st. Especially when starting out, you need to find something that you at least KIND OF enjoy (this doesn’t mean you will enjoy it every day, but at least the positives outweigh the negatives). Even if you are someone who inherently does not like to exercise, I PROMISE there is still something out there for you. So what if your friends are doing something else? So what if the blog you read on the internet said something else is better for you? Maybe it is. Maybe it isn’t. If you don’t want to do it, eventually you won’t. You will not be consistent. If you cannot be consistent, nothing else ultimately matters. Is this something you can see yourself doing 3-4 days per week for the next 10 years? If yes, give it a shot. I cannot guarantee your results…but I CAN tell you it is better than stopping and starting over, and over again. Once you get into the habit of doing SOMETHING, then we can look to fine-tune some of the details. Many of our members were in your position last year. They found a program, an environment, and people that made exercise enjoyable for them. They stuck with it…and so can you. We don’t have it all figured out, but I am very confident in the program that we have put together at BOLT. It’s a pretty darn good combination of doing things “the right way” and having fun while doing it. If you can’t enjoy it, consistency will be a challenge. In Part 2, we will discuss persistence. Things will not always go as planned. How do we prevent ourselves from falling totally out of our routine and break the good habits we have worked so hard to form? We will talk about that later this week. We have all seen it before. Most of us have been there before. We need to lose weight. We go on a diet. We lose weight. We go off of our diet. We gain the weight back (and then some). So we diet again. We lose weight. We go off of our diet. We gain the weight back. And on and on the cycle goes. I want to tell you about the time I quit training. I quit for about 8 or 9 months. It was about 2 months into my sophomore year in college. Many of us go into tailspins and panic when we are forced to deviate from our planned schedules. If we hit traffic and are forced to miss a workout, we panic. If he have a few glasses of wine and dessert at dinner, we panic. In our panic, we throw our hands up and say screw it…I’ll get back on track next Monday. I would argue that these reactions are one way to guarantee you will have a much harder time reaching success with your health and fitness goals. Instead of building out your schedule, I want you to think along the lines of building out a “loose template”. In our training programs, we have a general template that we work off of. This template is what we have developed around an “Ideal” training program based on the research and experience we have put together over the years. This program, as you all know, includes pushups. Well what happens when someone can’t do pushups for whatever reason? Do we just throw our hands up, panic, and say we can’t do pushups today? No. What we do is elevate your hands to a bar or bench. Shoulder pain? We move to a 1 arm press or a tricep band pushdown. We had to deviate from the “ideal” plan, but we still worked within the template we have designed. So how does this apply to you and your template? Is this the “ideal” plan? No. However, we still stuck to our template that includes 4 days/week of training. Maybe we had to do some things that aren’t ideal..like get home a little later on Wednesday or do lifts in a row instead of alternating…but we stuck to the template. You go to lunch with a friend and decide for the burger over the salad. You have two beers instead of water. Our “ideal plan” doesn’t call for this, but that does not mean the day (or week) is not salvageable. Maybe Dinner that night calls for a salad and water. We over-did the carbs at lunch, so we choose a lower-carb option at dinner to work within the general template. Is this ideal? No. But what do you think of the alternative? How many of you have taken a cheat meal and turned it into a cheat weekend? (ME!). We can’t panic every time we have a burger or slice of pizza. We just need to make some adjustments elsewhere to make things fit. The point is, life is going to get in your way. Schedule changes, job changes, injuries, social obligations, kids, sports, etc. Spoiler alert: This is going to happen to EVERY one of you. 1. Make the necessary adjustments and acknowledge that while not perfect, you must work with what you have. 2. Continue to take steps backwards every time things aren’t perfect (which they will never be for an extended period of time).